The Queen Elizabeth, launched in autumn of 2010, enhances Cunard's reputation for luxurious cruise travel. She mirrors the elegance of legendary cruise liners and maintains a modern luxury rivaled by none. 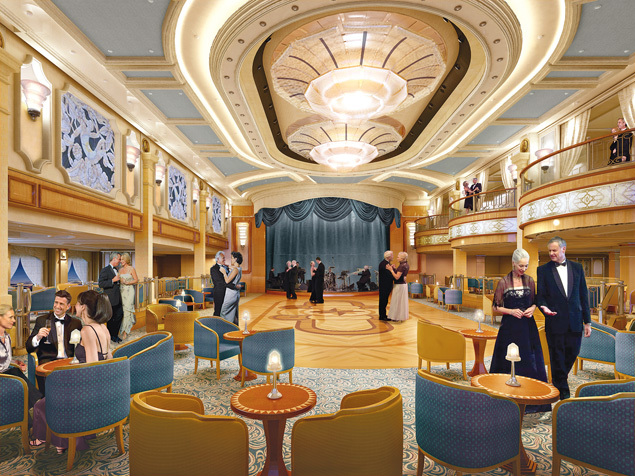 Classic and contemporary themes come together in the ship's plush and sophisticated décor, to create a modern charm that you'll love at first sight. 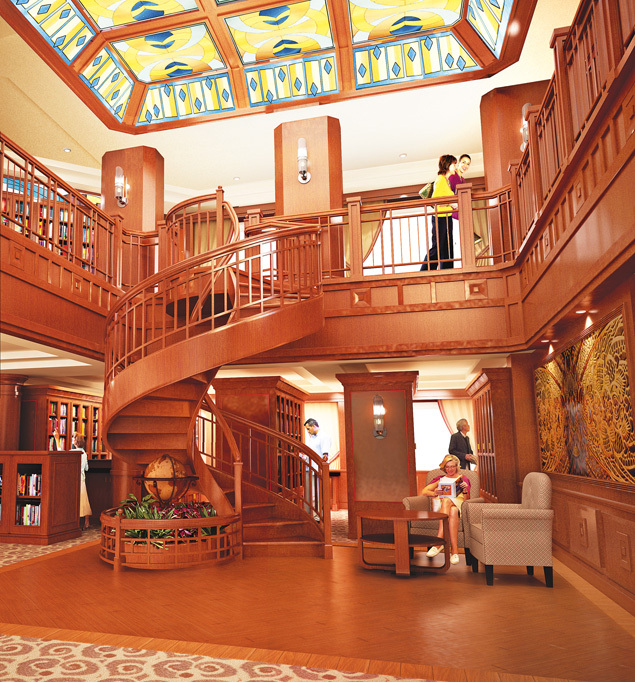 Curved staircases, spectacular artwork, stately paneling and plush furniture are a common sight on this grand vessel. Her staterooms are state-of-the-art, plush, and furnished to ensure your maximum comfort. Dining is an experience in of itself here, as some of the world's best chefs prepare your meals to order. Get ready for the cruise of a lifetime. 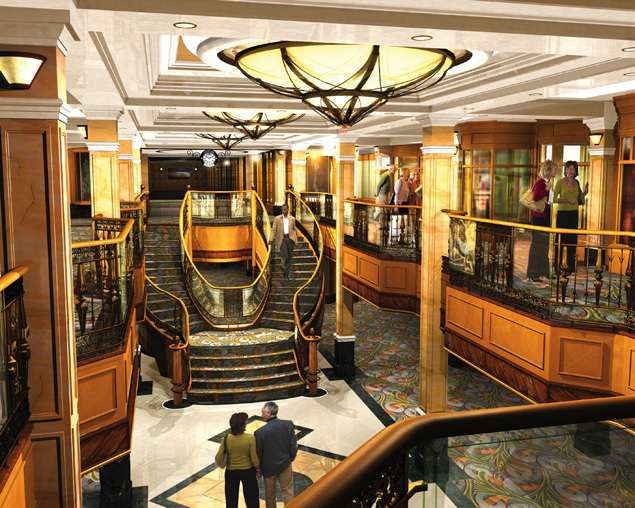 Enjoy a variety of activities on the Queen Elizabeth. State-of-the-art facilities are a standard on this fine cruise vessel. Start with dance classes - learn the lindy hop, the jitterbug, ballroom dancing and more. There is a Classic Film Club where you can enjoy tons of silver-screen movies, Insights where you can enjoy guest speakers lecturing about acclaimed novels, historic exploits, and more. Cunard Place features a collection of artifacts and images; the Games Deck is a great place to enjoy the English country garden ambience - croquet, traditional bowls, and even paddle tennis are available to play. The Library has over 6000 titles to choose from, and the Pavilion Pool is an invigorating place to enjoy the sun and water. The Cunard Royal Spa and Fitness Centre is an experience to behold - pamper yourself with a massage or a manicure, or work up a sweat in the full gym. Dining on the Queen Elizabeth is a culinary masterpiece - enjoy freshly prepared meals, all to your taste. Anticipation is a key element of the dining here - because, you will be anticipating your next mouthwatering meal from the moment the one before it finishes. Four elegant restaurants await - each geared towards the different stateroom accommodations you choose, and there are specialty venues to enjoy. The Queens Grill, the Princess Grill, the Courtyard, and the Britannia Club are all an amazing experience; assigned seating means you will receive the same service with each magnificent meal. The menus feature savory foods to delight any epicurian. The Lido Restaurant is another great spot. With a casual, airy atmosphere, this is a relaxed dining experience with delicious regional cuisines. The Queens Room serves afternoon tea, which is a Cunard signature. Fresh scones, cucumber sandwiches and tea are served while the beautiful sounds of the orchestra play in the background. The Golden Lion is a traditional English pub with a delicious gastro lunch menu as well as beer, cider or wine to complement your meal. 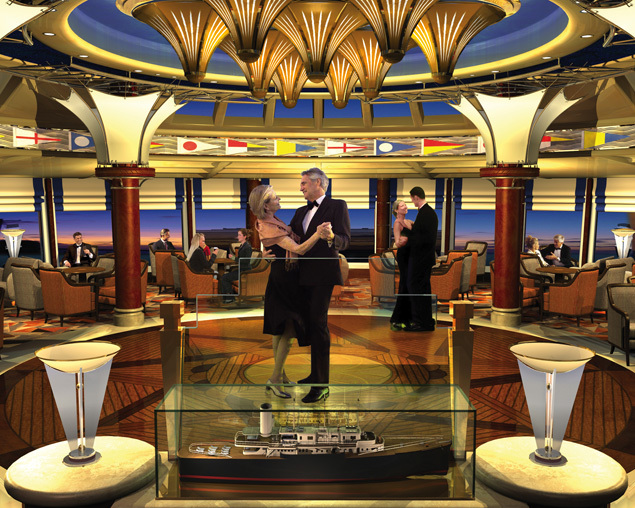 The Queen Elizabeth is equipped to keep you and yours entertained for the entire evening, every evening. The ship boasts intimate venues, delicious cocktails, great dancing, and more. The Empire Casino is a great place to play roulette, slots and black jack - try your luck and see what happens. The Commodore Club is an observation lounge with an amazing night view and a wide selection of martinis. The Golden Lion offers pub-style favorites including beer, cider, wine, karaoke and more. Midships Bar is another great, laidback lounge where you can relax and enjoy good company. The Queens Room is a Grand Ballroom that hosts themed balls like the Black and White Ball, or the Ascot Ball. 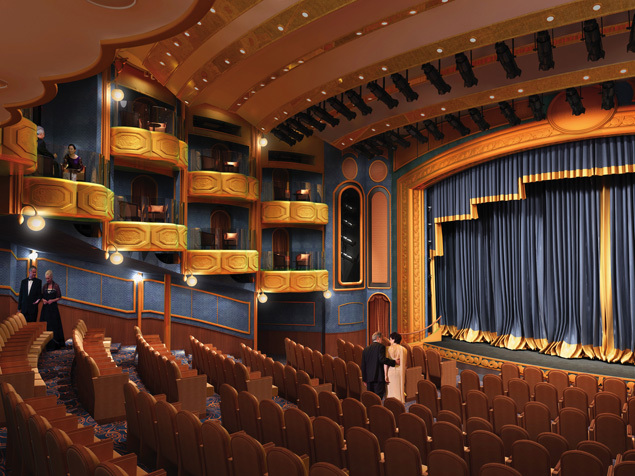 The Royal Court Theatre features live performances, music, musical productions, and more - and there are even private boxes. Finally, the Yacht Club is a great nightclub with a DJ and a live band for you to enjoy.